For many employees, the New Year signals a time to reevaluate goals and search for new career opportunities. Nearly 30 percent of US workers plan to change jobs at the start of 2017. That’s a big number. But if you’re an employer, how do you attract talented job seekers–let alone encourage the employees you have to stay? While many companies believe this is achieved by offering high salaries, appealing benefits like endless PTO and senior job titles (and yes, that may work), it’s not always the case. Here are four ways to attract talent, increase productivity and keep employees satisfied, without burning through big bucks. 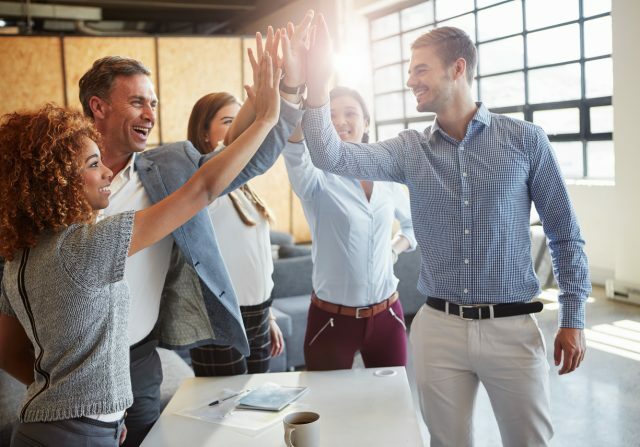 It sounds so simple, but recognizing and rewarding employees for great work can have a major impact on how employees feel about your company. In a survey of over 500 companies, employees who received recognition were much more likely to rate their workplace as fun. What’s more, the majority of respondents interviewed said that personal recognition would encourage them to deliver higher performance results. Behavior reaffirming compliments such as, “great job for helping us meet that deadline,” can go a LONG way in motivating and improving employees’ perceptions of your company. According to a New York Times article, employees who reported high levels of job satisfaction also reported having regular time for creative and strategic thinking. Coincidence? We think not. All employees — no matter their job, title or rank — want to feel engaged and flex their creative side from time-to-time. So provide opportunities for creative and strategic thinking. This could involve doing regular team brainstorm sessions, asking each employee to submit a few ideas to help meet this year’s goals or sending them to industry conferences to hear from market thought leaders. Whatever it is, make sure you’re tapping employees’ minds, engaging them in the bigger picture and showing you value their thoughts and opinions. While this isn’t an option for all industries, companies that can offer flexible hours—outside the typical 8-5 Monday-Friday time frame—or give folks the option to work from home, experience several high-impact and cost-cutting advantages compared to companies that don’t. Among them? Increased productivity. A study that researched more than 50,000 workers worldwide from the Corporate Executive Board found that employees who believe they have job flexibility work 21 percent harder. Lowered medical costs and absenteeism. Yes, stress/illness that resort in unscheduled PTO costs companies anywhere between $2,600-$3,600 per worker per year, according to Circadian, a workforce solution company. Those costs can quickly snowball. Think about it: if you have a 100 employees, you could be losing more than $260,000 a year. Reduced staff turnover and recruitment costs. According to the Hay Group, more than one in four employees who believed to have no support for work/life balance or flexibility from their current company, had planned to leave their jobs. Considering it costs a company almost three-fourths of an employee’s salary to hire and train for that position, you may want to rethink your policy. That’s costing your company roughly $45,000 to rehire for a $60,000 position. Improved company image. Employees that have more flexibility, are more likely to take fewer sick days and experience higher levels of satisfaction. They’re also more likely to say positive things about your organization outside of the office and that, my friend, is priceless. Employees aren’t just looking to make money, they’re interested in working with a company that makes a difference, too. According to a recent study, more than two-thirds of Millennials (age 18-34) and 60 percent of Gen X-ers (age 35-44) prefer to work for companies that give to charity. Getting employees behind charitable causes—whether it’s volunteering or determining which nonprofits the company donates to—also has a powerful impact on employee morale/job satisfaction. For instance, FirstBank offers all employees paid time off to volunteer with nonprofits they’re passionate about, and we also donate a sizable percentage of our profits to hundreds of charitable causes each year– many of which are hand-selected by staff. As a result, one-third of our workforce has been with FirstBank for 10 years or more, and we’ve been lucky enough to be recognized as a top workplace five years in a row.